Mama’s proud of her flourishing veggie garden. So when she discovers a stray chicken enjoying her greens, her first instinct is to reach for the spade. But what starts as an all out war develops into a grudging friendship, as Mama opens up to the chicken about her struggles with her old man, her palagi daughter-in-law, her immigrant neighbours and the grandchildren she rarely sees. Through this unlikely friendship, Mama learns there’s more to life than waiting for death. A beautiful, beguiling and very funny play about loneliness and the resilience of communities. David Fa’auliuli Mamea has worked on film, television, radio and theatre projects in genres ranging from sci-fi to soap, comedy to horror and documentary to drama. His play Kingswood was work-shopped by Auckland Theatre Company in 2016, and Goodbye My Feleni was produced throughout New Zealand in 2013. Still Life with Chickens won the Adam NZ play award (2017) and the Playmarket Best Play by a Pasifika Playwright (2017). 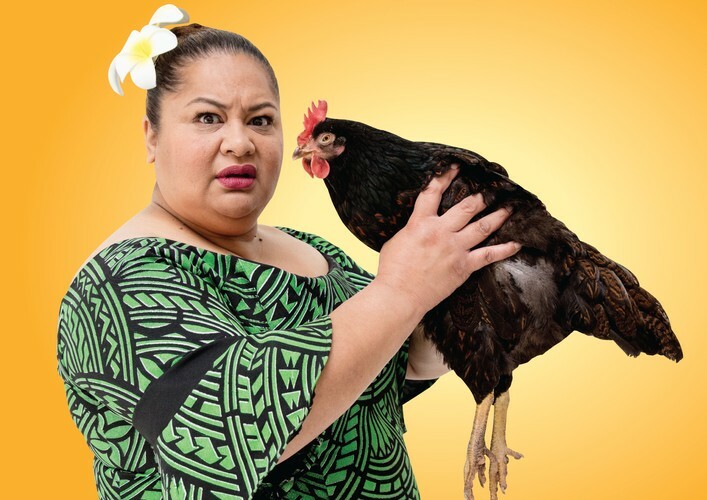 Still Life With Chickens will also play at Māngere Arts Centre: 8 - 14 March 2018.